As the largest living terrestrial mammals, elephants are usually considered as survivors under even the most dire climatic conditions. But all too often, these majestic giants are killed illegally for their ivory tusks. So, every dead full-grown elephant, whose carcass or skeleton is found with the tusks still in it, is a symbol of paradise – an elephant allowed to die of natural causes instead of bullets, snares or poison. Renowned wildlife filmmakers Dereck and Beverly Joubert take us on a journey back in time. The encounter with a dead elephant is the starting point: Who was this elephant, and what was his life like? A series of key point flashbacks help determine what this giant creature might have been, and to relive some of the stories he may have experienced. Great migrations for water reveal ancient paths, etched into the sand over generations. Recurring conflicts with lions and hyenas show the elephant its own growing strength. Nonetheless, there’s a very special case of lions that are actually on the hunt for the grey giants – by night, a pride of these big cats dare to attack elephants that have gathered at a water hole. The primary location of this film is the secluded Selinda Reserve in Botswana, north of the Okavango, where over 9,000 elephants live today as part of Botswana’s total elephant population of 120,000 pachyderms. Elephants are amongst the few sentient beings with which we share this planet. They are considered one of the smartest animals, along with dolphins and chimpanzees. This film focuses on the behaviour that makes elephants unique. 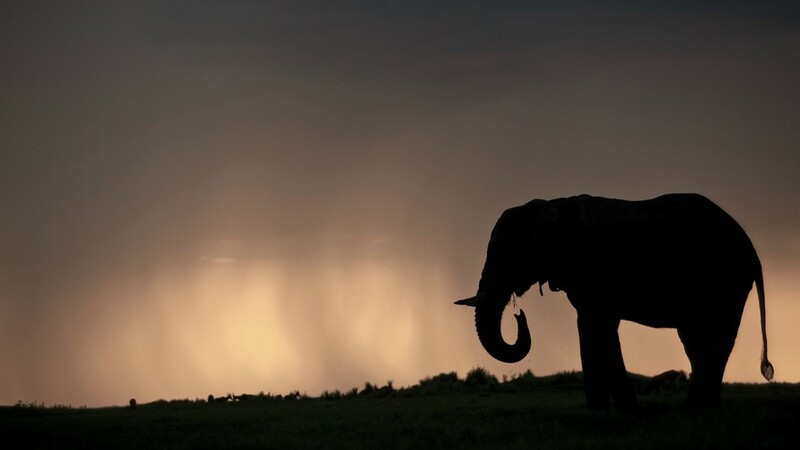 Elephantine greetings are next to silent communications: these giants use infrasound calls to communicate over long distances – extreme low frequencies, inaudible for the human ear. But there’s much more: clans gathering in thousands, herds collectively looking after a struggling baby while old bulls are fighting to the death. The joy of birth is closely linked to mourning rituals for their dead – this is when elephants weep. Exploring the endless possibilities and starting from a pile of bones, this documentary shows what one old elephant may have witnessed during the course of its long life. Spectacular and grand elephant portraits in the vast, wild landscapes of Botswana are complemented with intimate insights into what makes those magnificent animals what they are. Looking at the world through pachydermial eyes, we will come to understand what it takes to live an elephant’s life.